Materialism is the distillation that matter is the fundamental substance in nature, and that all things including mental aspects and consciousness are results of material interactions. Truth or Fiction should be the question you are asking yourself? In my interview with Mark Gober the author of “An End to Upside Down Thinking-Dispelling the Myth That the Brain Produces Consciousness, and the Implication for Everyday Life” we explore his through exploration into dispelling the materialism premise and providing the reader with substantial evidence that this can’t be the case. Mark uses the analogy that reality is like a stream of water where water represents consciousness and, each of us is a whirlpool. The whirlpools are made of water and are simply part of the broader stream that is normally filtered out of our perception. It is there —we just don’t’ normally perceive it unless we have a mystical or transcendental experience. I encourage you to listen to my interview with author Mark Gober as we explore the clear and compelling evidence that makes a case that consciousness is the force that precedes matter–and upends all the scientific and popular thinking that the brain creates consciousness. 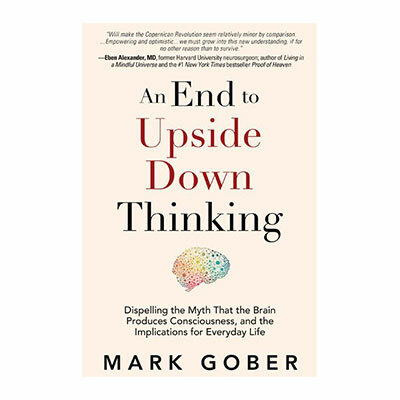 If you want to learn more about Mark and his new book “An End to Upside Down Thinking” please click here to be directed to his website. You can also watch a short video introduction to the book that you will find compelling and informative. ← Podcast 698: Peter Drucker’s Way to the Top with William Cohen, Phd.